The cost effective, 100% natural, non-pesticide solution you’ve been looking for! Everything you want… Nothing you don’t! If you live in a big city, the omnipresent threat of bed bugs is a major concern. New York City, for example, has experienced numerous bed bug epidemics. These insidious insects can attach themselves to your skin or clothing while you’re commuting, travelling, and staying in different locations. Bed bugs are powerful enough to grab the front pages of newspapers, the covers of magazines, and features in news reports with news of their determined and almost indestructible persistence. Even the suburbs aren’t immune to the threat of bed bugs. Many suburban hotels have reported infestations that have affected their customers, driven away their future business and added exorbitant costs for the extermination process. Whether your establishment is a four-star hotel in downtown Chicago or a two-star motel in suburban Nebraska, bed bugs are a scourge that ignores price points, reputations, and most precautions. Bed bugs can completely ruin the time your guests spend at your hotel or inn and even the rumor of an infestation at your establishment will spread faster than the most viral piece of publicity. As domestic and international travelers experience longer security checks, delays, and unparalleled levels of stress, in environments where bed bugs can victimize you, you can’t risk a bed bug infestation. Imagine the experience from your customers’ point of view. Your guests arrive at your hotel—sometimes very late—after a long journey, and they’re tired, wanting nothing more than just to unpack, turn in, and enjoy a solid eight hours of sleep. They can barely make it two hours, however, before they’re rudely awakened. The wake-up call isn’t from the alarm clock or even any loud noises coming from adjacent rooms. It’s an itching sensation that wakes up your guests, one that starts slowly at their extremities, crawling up their hands, feet, and ankles, and then quickly becomes excruciating. Soon, they are covered from head-to-toe by a colony of bed bugs. The least damaging resolution to this event would be your issuance of a refund to your customer. However, it’s likely this guest will never return and it’s probable that will also lose the future business of their friends and anyone else with whom they share their ghastly experience. In the worst case, however, you could find a news van and cameraman at your establishment to record and report the worst publicity imaginable. Bed bugs are uniquely adept to avert most of your precautions. They are defenseless, though, from one foolproof precaution that is cost-effective, completely natural, and exactly the non-pesticide solution you need to protect your hotel or inn. 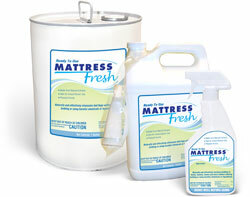 Continental Chemical USA is proud to offer Mattress Fresh, a 100% natural, safe, and effective non-pesticide to treat existing infestations or to use as a preventive regimen. Laboratory tests have proven Mattress Fresh to be highly effective in eliminating bed bugs. In a controlled setting where the treatment was utilized, the formula achieved a 98% kill rate in 30 minutes, and 100% kill rate in after three days. Continental Chemical is the exclusive seller and distributor of Mattress Fresh Natural Bed Bug Killer. The formula is also packaged and known as Avenger Natural Bed Bug Killer.